It is now that U2 albums started becoming "just another U2 album" for me. They now needed more of an effort to get them out and properly listen to them. Having said that, though, doing so has proved to be a pleasurable experience, when I have listened to them, and each of them reveals some hidden depths. I have read a wise comment somewhere that said that at many points in the career, U2 were often trying to make up for their previous album's perceived shortcomings. 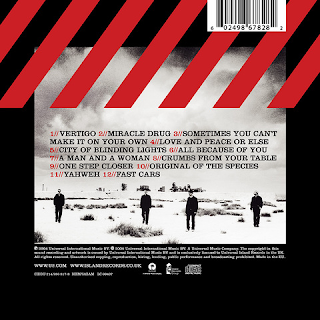 While "All That You Can't Leave Behind" was certainly not a failure, it seemed to me that on this album they tried to show that they could still rock out. This is one of their brashest, rockiest albums. All that dance music obsession that filled their incredibly bass-heavy, clunky nineties work had been left behind as they tried to to recapture their old edge (no pun intended). Electronica was left behind, the synthesised rhythms, drums and sledgehammer bass lines were gone too, as were Bono's muffled, mumbling vocals. It is, like its predecessor, an invigorating album. "Vertigo", it has to be said, is a rousing, stadium-pleasing rocker full of riffs and a hooky chorus. It was tailor-made as a live set opener and indeed was duly used as such, to great effect. It was one of their most instantly appealing songs for a considerable while. It even had hints of the early eighties in some of the guitar backing and a great rumbling bass line. "Miracle Drug" has a sumptuous guitar and vocal intro before kicking into a riffy rhythm and more harking back to the "War" album in its keyboard, drum and guitar backing and the general feel of it. "Sometimes You Can't Make It On Your Own" is a slow-burning, atmospheric rock ballad with Bono's vocals impressing. There is some killer guitar here too. Much as albums like "Zooropa" and "Pop" were admirably experimental and both are thoroughly interesting, challenging listens, I have to say I prefer this U2. I am not a copper-bottomed, dyed-in-the-wool or whatever type of U2 fan. I own all their albums, but as a admirer as opposed to an aficionado so I often find the fact that it now seems fashionable to criticise them a bit strange, because even time I listen to their albums I enjoy them. 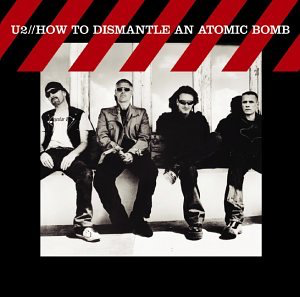 Take a track like "Love And Peace Or Else" - it is big, powerful, full of hooks and riffs and earnest lyrics and yes, Bono does himself no favours at times, but the guy has a great voice. This track is essentially a great post-punk track given stadium-ready power. "City Of Blinding Lights" is a great track, let's be honest. One of those typical early eighties guitar, bass and drum intros takes me right back to U2 circa 1983. No "poor old U2" can be applied derogatorily to this song. Not at all. Its fire burns brightly. "All Because Of You" is an exhilarating, riffy rocker. Yes, tracks like "Numb" and "Lemon" had a sort of mysterious, dense appeal, but this is much better. "A Man And A Woman" is a bassy and acoustic guitar-driven catchy number. "Crumbs From Your Table" is quite an intense song with some typical, nostalgic-sounding guitar sounds. Some criticise U2's guitar sound because it is so recognisable as them, but surely that is a strength, like Keith Richards, Jimi Hendrix or Brian May. The Edge has his trademark sound and that is a good thing. It is what makes U2 U2. "One Step Closer" is an evocative, mournful song. Bono does these songs so well. "Original Of The Species" has a sort of Beatles-ish late sixties sound to it. "Yahweh" is very much something that has echoes of the "War" album, for me. It has a moving-sounding refrain, and yet another excellent vocal. Unlike the usual slow, reflective number to close the album, we get the rhythmic, addictive "Fast Cars", with some beguiling Spanish-sounding guitar. This has been a most enjoyable album.